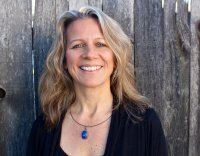 Lauri Pointer is a Healing Touch Certified Practitioner and Instructor and a Certified Instructor of Journal to the Self with a full time private Healing Touch practice in Fort Collins, Colorado. She has a degree in Exercise and Sport Science from Colorado State University with a Wellness Management Concentration. Lauri is a charter member of Healing Touch Professional Association. Lauri has been enjoying a full time career in the field of Healing Touch and Journaling since 1998. She currently teaches classes in Journaling, Intuition, and Essential Oils.